Dutch police on Saturday stopped Turkish Family and Social Policies Minister Betul Sayan Kaya's vehicle from entering the Turkish consulate in Rotterdam, reported local broadcaster A-HBR. 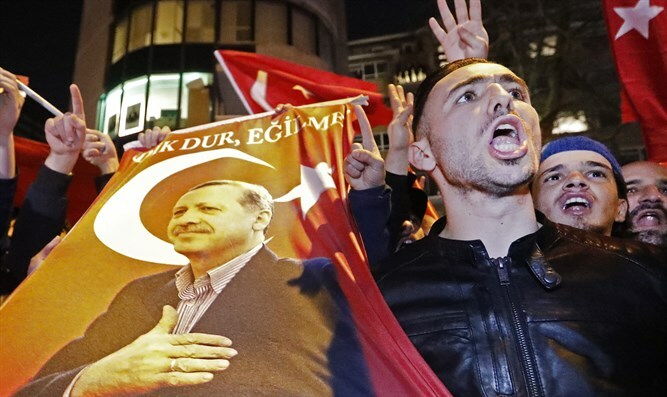 The Turkish Consul General's Rotterdam residence was blocked after 600 Dutch residents demonstrated peacefully on the streets outside the consulate. Kaya has announced she will meet Turkish citizens at her office instead of at the consulate. "Netherlands is violating all international laws, conventions and human rights by not letting me enter Turkish Consulate in Rotterdam," she tweeted. Earlier on Saturday, the Dutch Foreign Ministry announced the country had canceled Turkish Foreign Minister Mevlut Cavusoglu's flight permission due to "security" and "public safety" reasons. Cavusoglu was scheduled to address the Turkish community in the Dutch city of Rotterdam on Saturday.